Our Friday was not super exciting but that was okay. E went off to camp and then after Q's nap we went to Walmart (whoop whoop!). Yes, those are our four bags of chips on the conveyor belt. We went to pick up E from his camp. It was pyjama day and the dear soul picked out these ones with the fleece pants and long sleeved shirt. He did change into his swimsuit for water play when they went outside, but fortunately the school is air conditioned so he wasn't sweltering all day. After this photo I realized he'd forgotten his hat so we had to walk all the way around the school again to find it (which we did). After supper we took some time at the playground. On Saturday morning Dave went golfing so we took a trip to library. But first, this happened...fresh croissants from Patisserie 27 on Jane. Delicious! Arguably the best in the city. At the library E got stickers for his 6th, 7th, and 8th books read for the book club and he got another leaf for the wall. The goal is 12 books for the entire summer, so we will try to reach this goal this week! When Dave got back we drove up to Shelburne, Ontario, to visit my cousins. They have a golf tournament and dinner (with raffles and silent auction) to raise money for chemo patient care bags in memory of cousin Lynne. It was chilly up there but we had a nice visit with everyone. E's bombing around in the golf cart with the other kids and Q just crawled around. This setting was too picture perfect. If E had stood still for any amount of time I would have been able to get both of them in a photo. No filter on this. Lee-Anne, Melanie, and Chris starting the raffle draws. The next morning we weren't sure what to do with our day, then I opened Twitter and saw OpenStreetsTO was trending so we decided to go down there. Parts of Bloor Street and Yonge Street were closed to vehicle traffic from 10 to 2. We took the subway down. There was a drum display going on by the Royal Conservatory of Music. 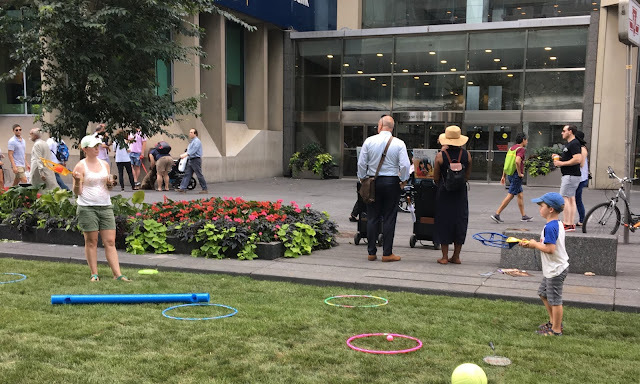 Some lawn games on Bloor. When we got home E had a friend over. Q was very interested in what they were up to. We made some chicken, veggies and dip, and potatoes (care of Jean!) for supper and my dad came back to spend a few nights with us before going home. We watched King Arthur and Game of Thrones and called it a nigh!